Love. This print marks the beginning of what is shaping up to be a fantastic creative adventure. 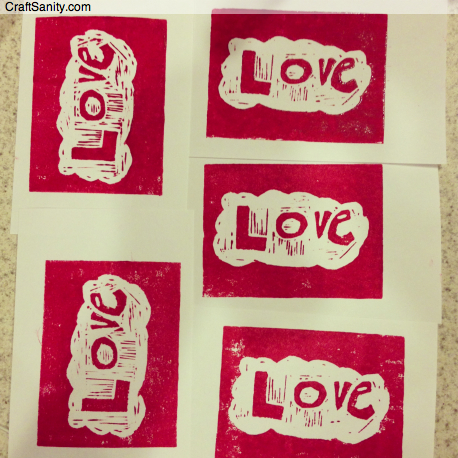 It all started when my 7-year-old daughter, Amelia, got hooked on printmaking at a free workshop in 2012. When I saw her happily making prints on an old book press, I knew it was time to finally surrender to the urge I’ve felt for many years to try to make my own. On Christmas Eve Amelia received a little blue press as a present from my father. It was made of scrap wood and pieces of the old cupbards from my parents’ kitchen and Amelia loved it and told my father on the spot. I think I loved it just as much. On Christmas Day, Amelia drew this “Love” design on a piece of paper and asked me to carve her drawing into a block. I was happy, too – ecstatic, actually. We started making prints as soon as the carving was done and I think we both knew immediately that this is just the beginning of something wonderful. Amelia has made many practice prints with her little blue press, and now we’re going to send a little bit of love out into the world and see what happens next. Today, Amelia, her big sister, Abby, and I will be demonstrating some basic printmaking techniques on WZZM Channel 13’s “Take Five” morning show. *** Magazine Update: There will be printmaking in the forthcoming spring issue of CraftSanity Magazine!